The inspiration behind this recipe comes from one of my favorite restaurants here in Charlotte, Cowfish. It’s become a go to lunch spot for us because the food is good, the menu is extensive and they have the best bento box for kids. Scottie and I have started going on the regular with a few of our friends and one of the side items off the menu is a Thai Cucumber Salad. After one of our lunch dates I decided my next mission was to recreate this tasty little salad at home. 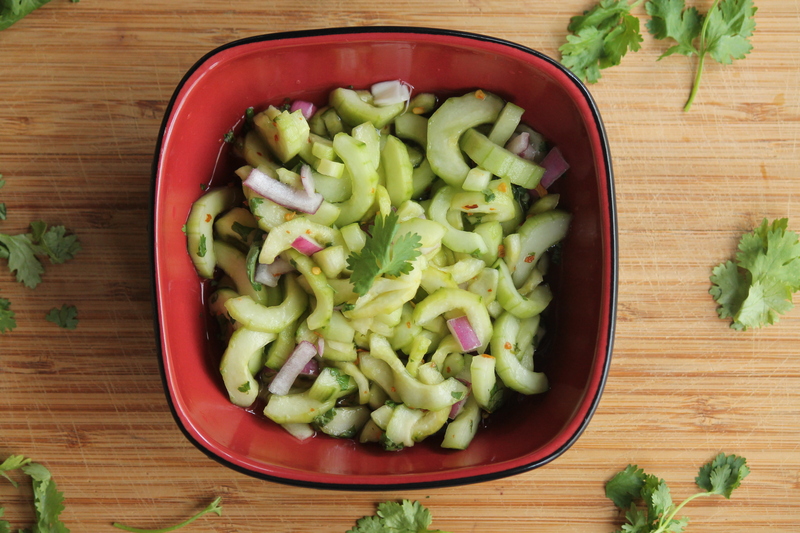 This Thai Cucumber Salad is light and refreshing making it the perfect side dish for the warmer months. It would make a great addition to an outdoor BBQ or picnic since it’s simple to put together and can be served at room temperature. There are different elements to this salad that makes it so unique, yet delicious. Crisp cucumbers are soaked in a sweet and tangy dressing and topped with aromatic cilantro and a hint of spice from the red pepper flakes. It’s everything you could want and more. In a small saucepan, whisk together the sugar and vinegar till the sugar has dissolved. Remove from heat. 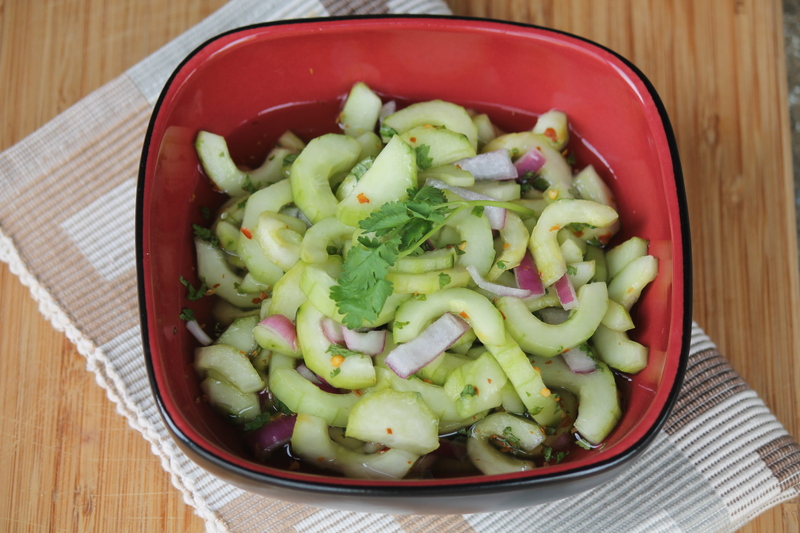 In a medium-sized bowl add the cucumbers, onions, red pepper flakes, salt and cilantro. Toss to combine. I have three cukes in the fridge right now that were just waiting for this recipe to be posted. Yay!! What a great cucumber salad! My family is obsessed with my grandmas cucumber salad, just cucumbers, onions, vinegar…and probably other stuff! Haha! Made this tonight to go with/on our steak fajitas. I was looking for a recipe that was like Cowfish. You nailed it! Everyone loved it and it was super easy to whip up. Thank you! I’m so glad to hear that. Thank you!